Should We Judge A Politician By His (Or Her) Garbage Supporters? So David Duke endorses Donald Trump. That’s neither Trump’s fault nor an indictment of him. If it were, Hillary Clinton would have some explaining to do. As was the case with other recent high-profile terror cases, the FBI was tipped off to Ahmad Rahami’s radicalization. What’s going on here? One man can neither unify us nor break us apart on his own. But it’s been a long time since we’ve had a president as divisive as Barack Obama. With the kind of ammunition the RNC platform provides, I’m not sure why some in the media felt the need to mislead people. Maybe Micah Johnson, like Charleston murderer Dylann Roof and Orlando terrorist Omar Mateen, was a screwed-up weirdo who went looking for a cause to support his desire to kill. How can we trust people to regulate guns who don’t know anything about guns, think normal people deserve to be on enemies lists, and allow ideology to keep them from protecting Americans? Those who seek to rewrite historic and biblical Christian orthodoxy to sanctify certain sexual relations are calling for a bridge that simply cannot be built. 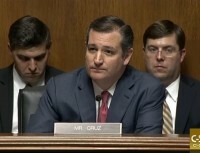 A Tuesday Senate hearing Sen. Ted Cruz chaired discussed the ‘willful blindness’ of Democrats’ approach to combatting Islamist terrorism. In al-Qaeda’s response to media coverage of the Orlando attack, life imitates satire. The Democrats’ gun-control sit-in was a failure at moving legislation. But it was a success at making us forget about terrorism. Many Democrats who refuse to acknowledge Islamic radicalism are now exploiting the ISIS attack to accuse fellow Americans of abetting terrorism. A friend to Omar Mateen, who killed 49 people and injured another 53 at a gay night club in Orlando , said the terrorist was a fan of Hillary Clinton. Saying Omar Mateen was born an Afghan is just another way to inflame this narrative that some U.S. citizens aren’t really Americans. The reaction to the Orlando terrorist attack shows how badly the Left is failing the minorities it claims to protect. The Orlando terrorist declared that he “did it for the Islamic State,” but the New York Times can’t figure out the “precise motivation” for his rampage. President Barack Obama finally lashes out at America’s real enemy: the GOP. Omar Mateen was motivated to attack a gay nightclub because he believed this was a righteous Islamic cause of jihad. Islamists have believed this for a thousand years.